One year after President Trump pulled out of the landmark Paris climate agreement, his administration shows no signs of progress, choosing instead to ignore climate science and boost the fossil fuel industry. 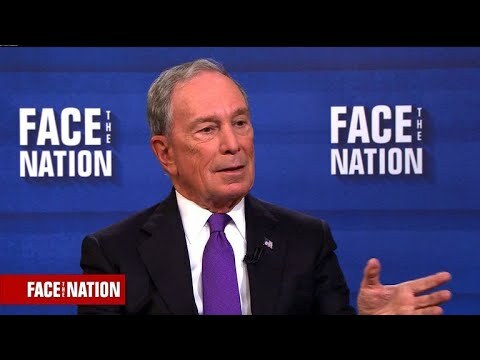 So today, former New York mayor Michael Bloomberg, the secretary general for the United Nations' Special Envoy for Climate Change, unveiled the Bloomberg American Cities Climate Challenge—a $70 million competition to spur aggressive city-level climate programs. Former New York City Mayor Michael Bloomberg will write a $4.5 million check to help cover the United States' commitment to the Paris climate agreement. His offer fills the significant funding gap created by President Donald Trump's plan to withdraw from the global climate accord, which made the U.S. the only country opposed to the deal. Trump has also proposed deep budget cuts for international programs, including ones on climate. A group of U.S. leaders, including California Gov. Jerry Brown and former New York City Mayor Michael Bloomberg, reaffirmed the country's commitment to its Paris agreement targets this weekend at the COP23 talks in Bonn, Germany. U.S. senators, governors, mayors, state senators and business leaders reiterated at the U.S. Climate Action Center that the U.S. is "still in" the Paris agreement. Some senators also met with international officials to assure them that they, along with state elected leaders, will not only challenge Trump's agenda, but that cities and states are making progress on their own. On Saturday, Bloomberg and Brown presented "America's Pledge," which will capture and quantify emissions reductions by cities, states, universities and businesses. It's a big week for me. Monday was the official publication date of Climate of Hope, my new book co-authored with former New York City Mayor Mike Bloomberg. Ocean warming from climate change could make some parts of the world "uninsurable," according to a new report from global insurance trade body, the Geneva Association. And these areas are unlikely to be the last that will experience such problems. But in the UK, hundreds of thousands of homeowners in areas at high risk of flooding will still be able to insure their properties, after the government struck a deal with the industry. The deal—introduced as part of the government’s new water bill—comes just weeks before the current agreement is set to expire and follows lengthy negotiations with the Association of British Insurers. The agreement will cap flood insurance premiums, linking them to council tax bands so that people in high risk areas will know the maximum they will have to pay, while a levy on all UK household insurers will be used to create a fund to cover claims for people in high-risk homes. The new bill also includes plans to increase competition in the water market and improve drought resilience. Meanwhile the government announced an extra £370 million of flood protection funding for 2015-2016 and committed to increase funding each year to 2020—adding to the £2.3 billion they say is currently earmarked for flood defenses. There has been rising friction in recent years between the insurance industry and governments around the world who are struggling to shore up flood protection. The Geneva Association—which is overseen by executives from some of the world’s largest insurance firms—warns that governments will have to step up their action to protect their towns from the effects of climate change. Warming oceans have already locked-in shifts in climate, even if countries’ attempts to reduce greenhouse gases proved successful. Given that energy from the ocean is a key driver of extreme events, ocean warming has effectively caused a shift towards a "new normal" for a number of insurance relevant hazards. This shift is quasi irreversible—even if greenhouse gas (GHG) emissions completely stop tomorrow, oceanic temperatures will continue to rise. As oceans warm, they expand, contributing to rise sea levels. Melting ice sheets and glaciers are also contributing. The average global sea has risen nearly 20cm over the past century—with faster rises seen in more recent years. In its most recent report in 2007, the Intergovernmental Panel on Climate Change estimated that the sea levels rose an average of 1.8mm per year from 1961 to 1993 and 3.1mm from 1993 to 2003. As well as rising sea levels, scientists believe warmer oceans contribute to an increase in evaporation from the surface of the seas, leading to heavier rains and the potential for more storms. Such factors may have contributed to Hurricane Sandy, which hit New York and New Jersey last year, costing the U.S. economy about $65 billion, warns the Geneva Association. Earlier this month, New York Mayor Michael Bloomberg announced a $20 billion plan to protect the city from future storms including building flood walls, levees and gates as well as funding for flood proofing measures for property owners and hospitals. The number of weather catastrophes, including storms, heatwaves and forest fires have risen from around 300 a year in 1980 to around 900 in 2012, according to figures from reinsurer, Munich Re. The new report calls on governments to invest more in flood defenses and tighten building restrictions in risky locations to mitigate the fallout of extreme weather hazards. They warn of the growing trend for an increasing number, and value, of properties being built along waterways and coastlines—pushing up the cost when disaster hits. On Feb. 29, Mayor Rahm Emanuel and Midwest Generation announced the planned retirement of the Fisk and Crawford coal plants, two of the oldest and dirtiest coal-fired power plants in the nation located in the heart of Chicago’s Southwest side. According to an agreement signed by Midwest Generation, the Clean Power Coalition, and the City of Chicago, the Fisk coal plant in Pilsen will retire in 2012 and the Crawford coal plant in Little Village will retire by 2014. As part of the Chicago Clean Power Coalition, Sierra Club has worked with an incredible group of local community organizations to retire these coal plants due to the dangerous health impacts on the families of Chicago. "Today’s announcement of the retirement of the Fisk and Crawford coal plants is a triumph for Chicago families," said Sierra Club’s Executive Director Michael Brune. "These old and dirty plants have been polluting two thriving Chicago neighborhoods for over 100 years. The effort to end pollution from the plants has been an uphill battle for a very long time. This announcement is the culmination of many years of hard work by local families and concerned residents in Pilsen and Little Village, and this victory belongs to them. Pollution from these coal plants has been making local residents sick since 1903, contributing to asthma attacks, respiratory illnesses and other health problems. This is giant leap in our work to move America beyond coal." Chicago is the only major metropolitan area with not only one, but two polluting coal plants within the city limits, and the Sierra Club, along with the Chicago Clean Power Coalition, has been working with Mayor Emanuel to retire these two Midwest Generation plants. The coal burned in these plants is brought in from Wyoming, the power is sold out of state, and the profits go to a California-based company, leaving Chicago to deal with the pollution. The announcement marks the end of a long and difficult battle led by the Chicago Clean Power Coalition to protect the health of the Pilsen and Little Village residents. According to a 2011 National Association for the Advancement of Colored People (NAACP) report, Crawford and Fisk were ranked number one and number three respectively on a list of the top environmental justice offenders national wide. While this is a tremendous victory for the health of Chicagoans, Midwest Generation still has four other major coal plants throughout Illinois. Midwest Generation will be making critical decisions in the next several months with whether to make risky investments in retrofitting these old coal plants or choose to set retirement dates and invest in clean energy. "Chicagoans can breathe easier thanks to Mayor Emanuel's leadership in closing these old, polluting coal plants," said Jack Darin, director of the Sierra Club, Illinois Chapter. "Mayor Emanuel knows that moving Chicago from coal to clean energy works for all of us, and we applaud him for his efforts to bring cleaner air to Pilsen, Little Village, and all of Chicago. Now, as America transitions away from coal, we call on Midwest Generation and other power companies to ensure that communities, workers and families will have a just and stable transition from working with coal to becoming leaders in a clean energy future." Last Year the Sierra Club joined forces with Michael R. Bloomberg, Mayor of New York City, and his Bloomberg Philanthropies to combat the dangerous health effects coal pollution has on children and families across the nation. “Mayor Rahm Emanuel and the City of Chicago have taken a big step forward in building a healthier and environmentally sustainable city. Mayor Emanuel is a leader who understands the need for immediate steps to improve public health and make long-term investments in our urban infrastructures,” said Michael R. Bloomberg, philanthropist and mayor of New York City. “Today is also a great step forward for the Beyond Coal Campaign that has been working with Mayor Emanuel, residents, and local organizations. With today’s development, Chicago joins the legion of cities across America who have committed to putting our country on a new energy path." Chicago has been a key target for Sierra Club’s national Beyond Coal campaign, aimed at replacing dirty, polluting coal-fired power plants with clean energy like wind and solar power. The Fisk and Crawford plants are the 98th and 99th plants to be retired since the Beyond Coal campaign began. They join the ranks of coal plants like Cane Run in Louisville, Kentucky and GenOn in Alexandria, Va. and a fleet of First Energy Plants in Ohio who announced their historic retirements in recent months. The Beyond Coal Campaign aims to replace dirty, polluting coal-fired power plants with clean energy like wind and solar power. The campaign, in conjunction with allies around the country, have stopped more than 150 coal plants from breaking ground, and the number of planned retirements continues to grow as the nation transitions to a clean energy future. The outlook for coal continued to dim in 2011 as dozens of proposed new coal-fired plants were taken off the drawing board and utilities announced over more than 25,000 megawatts of coal plant retirements this year—and the nation saw record investments in wind and solar. Plant by plant, community by community, citizens joined together this year to show that they aren’t waiting for Washington to move their local communities towards clean sources of energy like wind and solar. What's more, a game-changing partnership with Bloomberg Philanthropies this year made clear that coal power is on the way out—the $50 million donation will help the Sierra Club move the nation beyond coal, with the goal of retiring a third of the nation's aging coal plants by 2020. "Coal is a dirty and outdated fuel that is making our kids sick, causing asthma attacks and other health problems," said Mary Anne Hitt, director of the Sierra Club's Beyond Coal Campaign. "2011 was a landmark year where coal's prospects were eclipsed by clean energy—this is the year that investors realized that coal is a losing bet." "We are clearly witnessing the end of our dependency on coal and because of our successful efforts we are helping to move our nation toward a cleaner energy future that benefits both the public health and the public good," said Michael Bloomberg. Nationwide, the price of coal is going up, while wind and solar prices are coming down—making new coal plants a poor investment. Citizen opposition, rising costs of coal and increased accountability have stopped 161 proposed coal plants over the past decade. And in the past two years, an unprecedented number of utilities opted to close outdated existing coal plants and pave the way for clean energy innovation. In Alexandria, Va., a coal plant on the banks of the Potomac river—one that has been polluting the nation's capital for six decades—announced that it would phase out. In San Antonio, community groups heralded the mayor's announcement that the city would replace its coal plant with a massive solar power installation. In Centralia, Washington, a landmark agreement brought together workers and concerned citizens to retire the coal plant and make major new community investments in clean energy. And in the Southeast, an agreement with the Tennessee Valley Authority will phase out 18 units at coal-fired power plants and will invest $350 million in clean air projects. The end of 2011 also heralded a major victory, as Sierra Club and its allies applauded the U.S. Environmental Protection Agency's (EPA) announcement of new mercury protections, which will require coal plants to install modern pollution control technology. Most of the country's coal plants were built before 1980, and many lack modern pollution controls. As much-needed new guidelines go into effect to protect people from toxic mercury, soot and smog spewing from these outdated coal plants, utilities will need to decide whether they will invest in updating aging plants, or switch to more effective sources of clean power like wind and solar. With wind prices now as low as 3 cents per kilowatt hour in Texas—a third of the price of new coal plants—smart business decisions will increasingly point towards wind power. The call for clean energy has been especially strong on the more than 40 campuses nationwide where students are organizing to move beyond coal. Just this year Penn State University, Oberlin College, Case Western Reserve University, Ohio University, Miami University of Ohio, Eastern Illinois University, Western Illinois University, Southeast Missouri State University, Clemson University, University of Minnesota, and most recently St. John’s University (MN) have all made commitments to phase out coal plants on their campuses. One third of all of the campus-based coal plants in the country are now on their way to retirement. Students at Miami University won their campaign in just a single semester with actions including collecting more than 2,000 petitions and hosting an underwear flash mob while students at Ohio University celebrated victory in one of the longest-running and toughest Campuses Beyond Coal campaigns in the heart of coal country. "Citizens across this country who are frustrated at the lack of leadership in Congress on critical issues of clean air, new jobs and combating global warming are taking action and seeing real results in their local communities, plant by plant, state by state," said Hitt. "The sooner we make the transition off of coal the sooner we can all breathe a little easier." The Sierra Club Beyond Coal Campaign is a nationwide campaign working to stop the construction of new coal plants, to phase out existing coal plants and replace them with clean energy like wind and solar, and to keep U.S. coal reserves underground and out of world markets. Click here to learn more.